This is a SWT reserve on the edge of Kilwinning, to the north of Irvine (NS 05 418). Access is from the A78 north-bound just beyond the Eglinton interchange down the B779 signposted Bogside (note that there is no access back onto the A78: you need to follow the road into Irvine). The Irvine-Glasgow cycle path goes along the edge of the reserve. 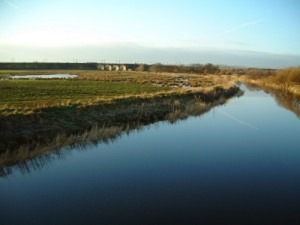 The reserve consist of a band of trees, fields and ponds bounded by the River Garnock, Ayr-Glasgow railway and the A78. There are no hides. The best viewing is from the cycle path or the fishermans’ path beside the River Garnock that goes towards the railway viaduct. Park at side of road. Viewing for wheelchair users is limited to a very few gaps in the hedge. National Route 7 goes along the boundary of the site, linking Irvine and Kilwinning. This forms part of the Irvine Circular Trail. Although the reserve has open water throughout the year, as its name suggests, it gets flooded by the River Garnock in winter making it particularly attractive for wildfowl including Shoveler , Wigeon , Teal , Goldeneye , Tufted Duck , Little Grebe , Mute Swan . In spring there can be Garganey . Kingfisher and Grey Wagtail have been seen on the river. The pond edges are good for waders including Snipe , Redshank , Curlew , Heron . These ponds have recently been enhanced by excavation work by the SWT. Livestock are used to improve the habitat for nesting waders and grazing wildfowl. In autumn the area attracts passage migrants such as Ruff and recently a Black Tern . Squadrons of Starlings arrive to feed along with an assortment of common finches. The fields are a gull roost but this has become smaller since the closure of the refuse tip across the road. The belt of trees is good for Redwing and Fieldfare in winter, and migrants in spring ( Sedge, Grasshopper, Garden and Willow Warbler, Whitethroat and Blackcap breed) although they can be surprisingly hard to see despite being very close! Sand Martin are common as they are nesting in the nearby Ardeer area, and along with Swift and Swallows feed over the water. Kestrel , Sparrowhawk and Buzzard can be seen along the railway. In summer the reserve is pretty quiet. This reserve is particularly good when combined with other local sites (such as Bogside> and Shewalton).